Planet Earth is doomed with a fast growing global population and a limited amount of farmland to produce food for everyone. That means that we’re going to need to figure out how to maximize what we’ve got—and researchers just made a major breakthrough in getting the most from our crops. Biologists from Cold Spring Harbor Laboratory have come up with a new agricultural technique which they say increases their crop yields by an incredible 50 percent. The key, they say, lies in figuring out how to use an existing genetic mutation that’s been creating some really weird-looking ears of corn. Scientists have long suspected the existence of a genetic pathway that acts like a set of brakes on a growing corn plant and stop an ear of corn before it got too big. As outlined in a new paper in Nature Genetics, researchers finally identified that pathway. And what’s more exciting is that they’ve figured out how to use it. The team was able to identify plants with a fea3 mutation that essentially removes the brakes that stop an ear of corn from growing. The results, however, were not quite what you’d expected. Instead of giant ears of super corn, researchers found that plants with the mutation produced small, misshapen ears. “The plant makes far too many stem cells, and they give rise to too many new seeds—seeds the plant cannot support with available resources (light, moisture, nutrients),” lead author David Jackson explained in a statement. While lots of kernels initially started to form on the ears with that fea3 mutation, the unchecked early growth made the plant so heavy that it collapsed under its own weight. In the end, the ears were actually smaller, and had fewer fully developed kernels than the ears without the mutation. 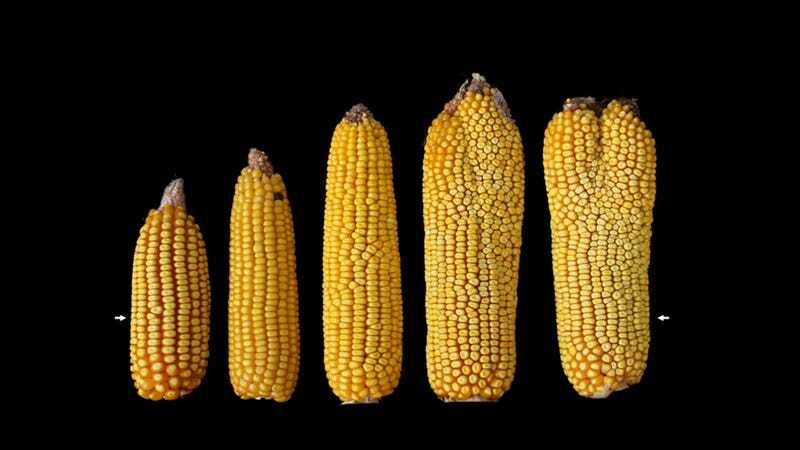 Still, figuring out how the mutation worked was enough to give the researchers an idea: perhaps a more muted version of the mutation could give them more kernels of corn but not so many that it killed the ear. Researchers were soon able to generate a weaker version of that same fea3 mutation—and found that not only did the ears survive, they were considerably bigger than normal ears. The ears were so much bigger that researchers estimate that, on average, an ear of corn with the weak mutation was throwing down 50 percent more kernels of corn (with no other changes to the growing process) than they’d seen previously. The implications of this research are much bigger than just a little extra corn, though. Similar “brakeless” mutations have also been seen in most of the world’s other staple crops. This suggests that a similar process could work to bump up their yields as well. If it works, it could give us a way to feed much more of the world, without planting new farms.